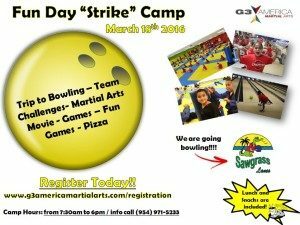 G3 America Martial Arts is hosting another fun and awesome Fun Day Camp on Friday March 18th with martial arts fun classes, challenges, leadership, games and a field trip to Sawgrass Lanes with lots of bowling, pizza and fun!! The idea of all our camps is to provide a challenge and joyful environment surrounded by structure and principles of leadership. We believe every child was born to be a great leader and a world changer and we encourage them to their full potential!